Here we go with another one of the oldschool tracks that make up the Transport Tycoon soundtrack; this one is called "Broomer's Oil Rag". I'm not quite sure what a "Broomer's Oil Rag" is but my best guess is that John Broomhall happens to have a nickname of "Broomer" and "oil rag" is a pun since a "rag" is a name given to "ragtime" music that was popular in the early 20th century (Scott Joplin's "The Entertainer" is arguably the most popular example of this genre). 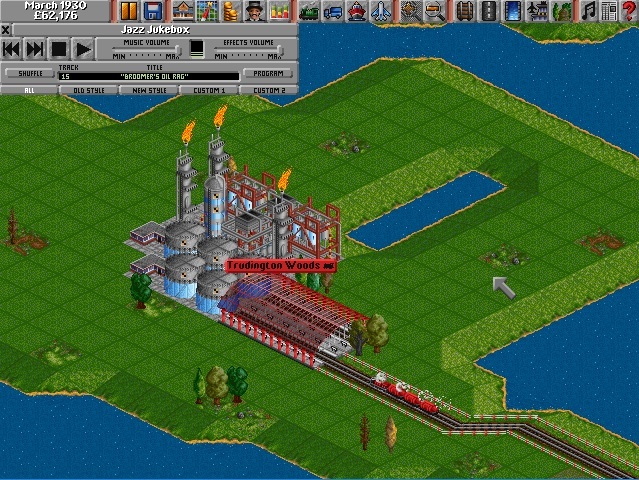 Anyway, here's a screenshot of a train delivering some oil to an oil refinery (while we're on the topic of oil). Did you know that later in the game oil rigs would spawn in the oceans around the continent you play on? They even have helipads so you can send choppers over - neat!